2001-SRN located at Cleveland Road and Main Street. The pole from a former Model 5T stands next to the 2001. 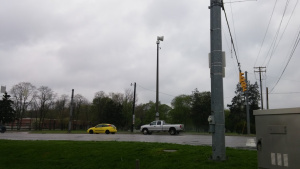 The siren system in Saint Joseph County is a countywide siren system that consists of various models of 2001 series sirens, and three 508's. The 2001's consist of 60 2001-SRN's, 6 2001-SRNB's, and a single 2001-130 that replaced a 2001-SRN that was struck by lightning. The old system consisted of Model 2T sirens, but mainly Model 5T sirens. They would be tested on the first Thursday of every month at 11:30 AM. The sirens had a strange timing, creating a custom fast wail. The timings were 5 seconds on, 2 seconds off. In 1999, there were 60 2001-SRN's installed, 50 of them were spread out by 2 miles. The sirens were installed by Braniff Communications on concrete poles. A 2001-SRNB was added to Greene Intermediate School in the early 2000's. A few years later, 5 2001-SRNB's were added. 2 in Crumstown, two in Walkerton, and one inside the LeMans Hall bell tower at Saint Mary's College in South Bend. In 2010 (Possibly) a 2001-130 was installed on siren #61's pole because the original 2001-SRN there was struck by lightning. In 2015, three 508's were added in Cleveland Township in Elkhart County but Saint Joseph County controls them. In 2018 or early 2019, another 508 was installed in Granger next to a Pak-A-Sak Gas station. The 508's do one minute alert, and the bell tower 2001-SRNB does three minutes of alert. The original 2001-SRN's were installed on concrete poles, but they weren't installed properly. The siren heads were placed on the poles first, then the poles were put into place, breaking the mounting bracket. The sirens with broken mounting brackets are known to "Wobble" around as the siren head rotate. The control boxes are also slowly deteriorating. Siren #6 in the system had batteries hanging through a broken battery box. These changes are being put into full effect with the the county EMA director (John Antonucci) having rectifiers installed on the DC-Only sirens. There were problems with battery chargers too, and those are being changed out for new battery chargers. New battery boxes are also in the process of being installed on sirens with completely deteriorated battery boxes. This page was last edited on 17 April 2019, at 21:03.